It takes a while to get the hang of this game, but once you've got it it can be really fun. You can choose a horse from many gorgeous ones. Then you care for it, and earn money to buy more cute clothes. After hard training you enter competitions and gradually increase your level. Once you become a top competitor the owner of the barn where you keep your horse gives the place to you! And you become the stable owner. This game is really fun and it is easy to control. The graphics aren't that good. It is ideal for younger horse lovers! It is fun. Hard at first to steer and jump, but once you get the hang of it it's fun. I finished the whole game in 2-4 days. I would suggest it for someone that wants a quick, easy, game for horse lovers. i have this game and i have finshed it in like 2 weeks. it was really easy but not that fun. It's ok. 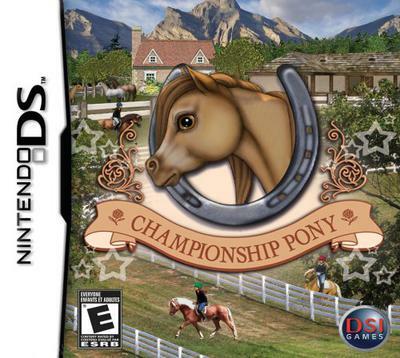 I really like this game i would recommend it for any horse lover, it is an okay game but not my fave. This game is like heaven to me! First start running through the cones. Then start to jump the logs if it is your first time jumping you will go to competitions and have so much fun! this game is challenging and hard to get used to but u learn quickly so that is good. u may get frustrated but don't give up.